Each objects in NodeJS emit an asynchronous event. That event is handled by an object EventEmitter. EventEmitter is underneath every object. EventEmitter object provides asynchronous event handling to Node object. Now you can attach an event using on eventhandler and emit an event using emit eventhandler. There are two steps involved in creating an event. You can attach an event using on event handler. You can emit an event using emit event handler. To attach an event you need to call on method. This takes two parameter. 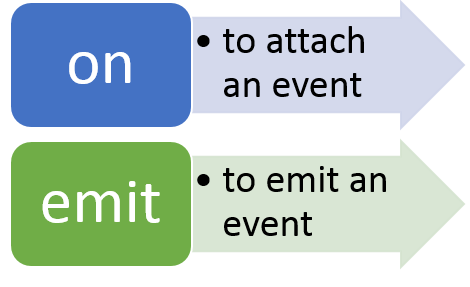 Functions to be called when event will be emitted. You can add an event as follows. As you see there are two parameters. ‘error’ is name of the event and errorFunction is function called when error function emits on myLogger. In last step you can emit an event as follows. You need to pass event name and message(if any) to function. In further posts we will get into details of events in NodeJS. I hope you find this post useful. Thanks for reading. copy and pasted code. didnt work.